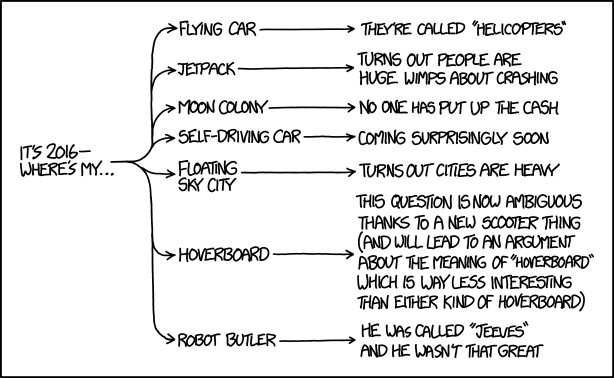 xkcd provides a 2016 conversation guide, for those pesky "Is this the future?" discussions. But for the world in general, I'm not so sure. Though the Paris Climate Treaty is encouraging, the fact that one of our political parties is in thrall to wealthy CC-deniers is not. My current apocalyptic worries are along the lines of the "Jackpot" in William Gibson's The Peripheral, where it's not one thing that collapses civilization, but a bunch of catastrophes lining up like bells on a slot machine. And for the US, we're all going to be playing a game called Fear and Loathing on the Campaign Trail. For many years the motto of the UHaul company, painted in large letters on all their vehicles, was "Adventures in Moving". I don't know whose idea this was, because it's got to be one of the worst mottoes in the history of advertising. "Adventures" is precisely what I *don't* want when I'm moving -- I want everything to be boring, predictable, without a hitch or even a good anecdote. I did not get my wish. I won't tell you all our so-called "adventures", because it would be boring for you and traumatic for me, but it involved things like: discovering two different large pieces of furniture didn't fit where they were supposed to go; no running water on Christmas Eve; very few showers; and that sinking feeling that you really, really own too many books. Photo by me. Clearly, I'm not yet very good at taking landscape photos, especially the part where the blue sky looks blue, but this should give you a general sense of how sweeping and lovely the view is from our porch. Every time I see it, it lifts my heart. So with all these adventures, I am actually glad that illness kept my parents and brother from making it down for the holidays. I'm also glad the kids are old enough that we could all emotionally detach from present-giving, and concentrate on getting our house kinda sorta in order. Not to mention figuring out how the appliances work. I keep singing the Jetsons theme song, though somehow I keep segueing into Meet the Flintstones, probably because it's a better song. Between the induction range, the microwave-in-a-drawer, the electronic water management system, and the feature-laden Bosch dishwasher, I definitely feel all Space Age. One reason the holidays got short shrift this year is because I'm suffering from massive decision fatigue. I know there are people who can shop or arrange things for hours and be energized by the process, but I honestly can't imagine how their brains work. I worked with a kitchen and bathroom designer this time in large part because if I'd had to do things like choose grout colors I would have melted down like the Witch of the West. I'll post more pictures of the new kitchen later, and in just a bit I'll put up a spoilery post about our Christmas observance. Meanwhile, have at it. When is the presidential election again? 10.5 months you say? Gah. 2015, a meh year. Here's hoping 2016 is better, insha'Allah. Just in case someone wants to comment. Beyond my personal astonishment that Mr Trump's staff didn't try to get him at least minimally informed about how the Internet works. (Although I suppose those could have been totally off-the-cuff remarks.) Not that total ignorance appears to have slowed any of them down when proposing foreign policy "solutions". -- but at least I'm packing to good music. I haven't posted or commented much recently because our house renovation is at the "Run in Circles Scream and Shout" stage. Theoretically we start moving in on December 19. Theoretically. Also theoretically, my parents and brother will be with us for Yule beginning the evening of the 27th. Since the new place is only a mile away from here as the crow flies (about 2.1 miles as the car drives), we can move piecemeal ... if we're packed. The sound is revolutionary: both music and lyrics are incredibly dense, full of references and layers. Miranda's lyrics are nearly Shakespearean in their speed and compexity, while his use and re-use of musical themes and leitmotifs is Wagnerian -- if you play a 33 1/3 record of "The Ride of the Valkyries" at 78. And that's all aside from the ground-breaking casting that makes absolutely every character except George III non-white, because that's the only way to *show*, not just say, that America belongs to all of us. Speaking of historical change, one of my moving-related tasks is to get some new pots & pans, as we're making the leap into 21st-century cooking: an induction range. I already have a few cast-iron items, but I need new frying pans, sauce pans, and a big pasta/potato pot. My biggest concern is to replace my everyday pan, which I really do use almost every day. Do any of you have any experience with these pans? Or something else that fit my requirements? An Old Woman Cooking Eggs, by Velázquez. She's currently on tour, in New South Wales. Everyone is jumping on Scalia's racist uncle act, (perhaps the take by Andy Borowitz is best) but to me, Roberts is the embarrassment. This increased diversity, Garre argued, satisfied the university's educational goal of bringing unique perspectives to its classrooms. This assertion drew a caustic response from Roberts: "What unique perspective does a minority student bring to a physics class?" This is ground that we've actually already gone over here, believe it or not, in the women in sports thread. It is not a simple question of women's abilities, it is the entire pipeline that brings a person from child to pro pitcher. And Roberts fails to understand (or pretends not to, which is probably worse) that research often advances when outsiders come in. Like this. Solicitor General Donald Verrilli took issue with this data, pointing out that the number of black students admitted at UT increased from 141 in 2004 (the last year before race was added to holistic admissions) to 262 in 2007. Enrollment at UT Austin in 51,313, so we are talking about .2 percent. Sheesh. As we keep hearing, drone aircraft are supposed to become an Amazon delivery option. And already they are spreading to hobbyists. Unfortunately, effective controls over who flies a drone, where, and with what kinds of skill are still notable mostly by their absense. Will we have to wait for a serious accident to actually happen for the FAA (or the legislatures) to get their act together on the subject? Because we are starting to get close to the point where a drone will (accidently) bring down a manned aircraft in the US. Two fun posts, so why not a third? Something Russell has often mentioned, in a video below the fold. Enjoy.